For a moment I was elated. I felt the rush of a mountain climber reaching the summit of Mount Everest. I sat back on my heels looking at my now empty bookshelf with a sense of accomplishment. After culling through my Intending to Read pile, I’d managed to restack both my fiction and nonfiction reads into one shelf! I had a whole shelf sitting empty! I sighed and leaned back, basking in the glow of self-satisfaction; a momentary triumph over my book hoarding. But seconds later it was gone. I’d hit something as I leaned away and turned to see what it was. Damn it! I had forgotten that I started piling the keepers up to my left. Somehow, as I moved about, the pile was to my back. Oh well, it was a nice feeling while it lasted. 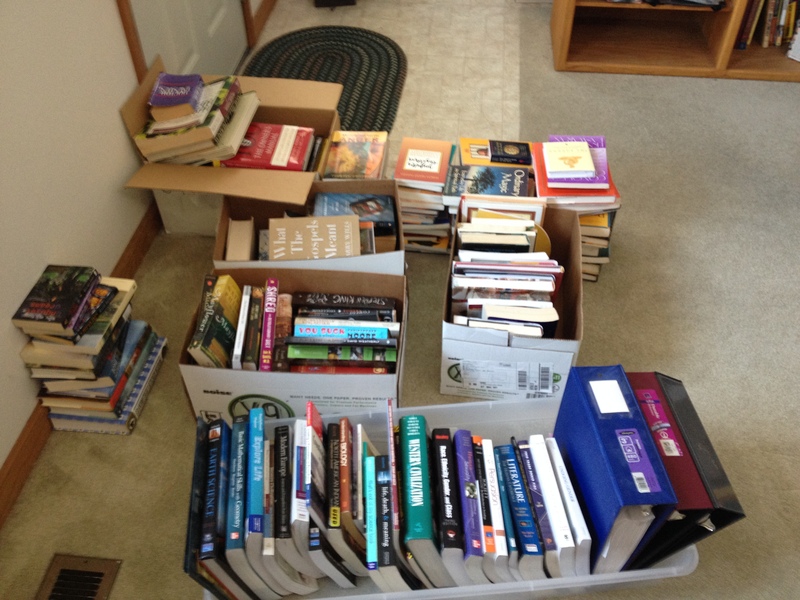 Today I finished book sorting. I started with my text and reference books and ended with my personal Grendel, the foe I never thought I would defeat, the dreaded Intending to read shelves. Over the course of a few hours I learned a few things about myself and book collections. I know, I know, most normal people sell their used textbooks back to the university bookstore after each semester. I’ve kept all of mine. It became a habit. The year I decided to go back to school the university tried an experiment. Instead of buying expensive rarely opened tomes, the university decided that most text would be offered as downloads or as PDFs to be read on computer screens. This was supposed to save students money. Personally, I think the school was at war with the bookstore and we students were the collateral damage. Because of all the color pictures, charts and graphs found on almost every page, it ended up costing us almost as much in paper, ink and binders as it was to buy them! I actually burned out a small printer by the end of the spring semester. At the end of each semester instead of tossing the multiple binders I amassed, I instead shelved them high in my office closet. So, after switching back to textbooks, it was a habit to keep my books. A few times I found myself pulling out an older text when doing research on a paper. Once my son was in high school, my old text came handy for his research. My habit of keeping texts was cemented by their usefulness. This morning I pulled out every textbook I owned and scattered them on the floor in front of me. I thumbed through each with one question in mind, “am I really ever going to use this again? “Out went sociology, psychology, gender studies, math (for someone who hates math, I own a lot of math books) and an old history book that I’ve kept since 1983. I’m keeping my German language and literature books, philosophy, art, science, (well okay, I got rid of two. Who needs three natural science textbooks? ), western literature and post-modern humanism. The one’s I’ve kept are ones that I have and still use as reference books. All the others sat as a testament to my academic endeavors. I found I no longer needed to remind myself that I finished college. Isn’t that what the piece of paper hanging on my wall is for? Culling through my textbooks was easier than I had imaged. Maybe because I went at it with a single minded approach or maybe because it was a chore to be done. Either way, the ease at which the task was accomplished gave me the courage to plop myself down in front of my Eastern Religion bookshelf. Coming face to face with these books I wondered if I could do it. Could I even pull one book from this sacred space? As I sat staring at the books, an old Buddhist story came to mind. A student was eager to learn more and more about Buddhism. He wanted to be a great Buddhist master. His teacher told him that ,Buddhism was like a boat. The boat can only get you across a river. After that, you have a choice; you can either tie up the boat and continue on foot, or you can drag the boat with you everywhere you go. At some point your education must come to and end. At some point the Buddhist principles are a part of you. There is no more reason to try to grasp at Buddhism as you travel through life. The same holds true for the books I had in front of me. They served their purpose. Back when I was in California living a completely different life, these books helped me become a better person. They taught me compassion, patience, and self- acceptance. As a collection they’ve been an important part of my life. I took them with me on two big moves. But now, pulling them out and examining them, I realized it was time to moor the boat. It was time to pass them on to someone else who might need to cross the river. Intending to Read- when is someday? Feeling a little empty and a little relived, I moved on to the last set of shelves; the physical manifestation of my reading habit delusions. The dreaded, Intending to Read shelves! I pulled them all off the shelves, then after dusting the whole bookshelf, I picked each one up and asked myself a question, “If I had time, would I sit down and read this right now?” If the answer was “no” (and in this I had to be brutally honest) the book went in one pile, all “yes” went into another. Here is the weird thing; it only took me about 10 minutes to go through these because of these two questions. I now have a nice small collection of books I’m looking forward to reading soon. I’m not sure how I feel about these boxes of books I now have in my office. I wish I could tell you I feel a huge burden has been taken off my shoulders, or a sense of relief, knowing I was able to let go. But I can’t. I feel a little numb. I don’t know if I feel as if I’ve lost a limb and am in shock or if I’ve had a tumor removed and the anesthesia hasn’t yet worn off. Only time will tell. Next chore up- one hell of a garage sale! Well done! Hope you ‘feel’ the benefits soon! You have some good tips on all the decisions needed. Thanks for sharing! Thanks for taking the time to read about my day Gill. I hope I’ve inspired other book hoarders to clean their shelves. If for no other reason that to fill them up again! I feel your pain: still can’t bring myself to throw away my old and (uncharacteristically, for me) meticulous Latin notes! The boat parable is one that most strikes a chord with me, Sari, but I absolutely recognise the rest of your task and your approach. One to emulate, methinks, on the last phase of my own weeding. I’m glad it came to me, or else I’d still have five shelves of Buddhism, though the parable can apply to anything we hold on to far longer than is necessary. Good luck with the last phase. Remember, the boat is heavy. Tie it up! Oh that’s a groaner, but it made me laugh. Always worth a try! I’ve just repeated it in my last bookweeding post, and referenced your post in it, so others can groan too! Next Next post: When is a Shakespeare play not Shakespeare?